Hello out there!!!! As some of you may have noticed, I don’t have a regular schedule of when I do a post. I’m lucky if I can get one in a week. Lately I’ve been trying to swatch like a crazy person when the sun is out (*very rare btw*) so that on gloomy day’s I have something to blog about. So just earlier this week, I had been digging around in…something, I can’t remember and didn’t even notice that I had sliced part of my finger really close to the cuticle. I nearly screamed out loud at this discovery. So anyways this little gash made a horrible huge hanging piece of skin. It’s still healing very well but what makes me mad is that besides this being unacceptable for doing any photos of what I’m actually wearing…..It’s SUNNY outside!!!!!!!!!!!! Ugh.. Great lighting that I can’t even use. Maybe I might anyways and just cover up my ugly little scab in Picasa…. Anyways! Hopefully things will start looking better within a week so I can get back at it. In the mean time if I’m not super busy I might do a nail tutorial on a fake nail. 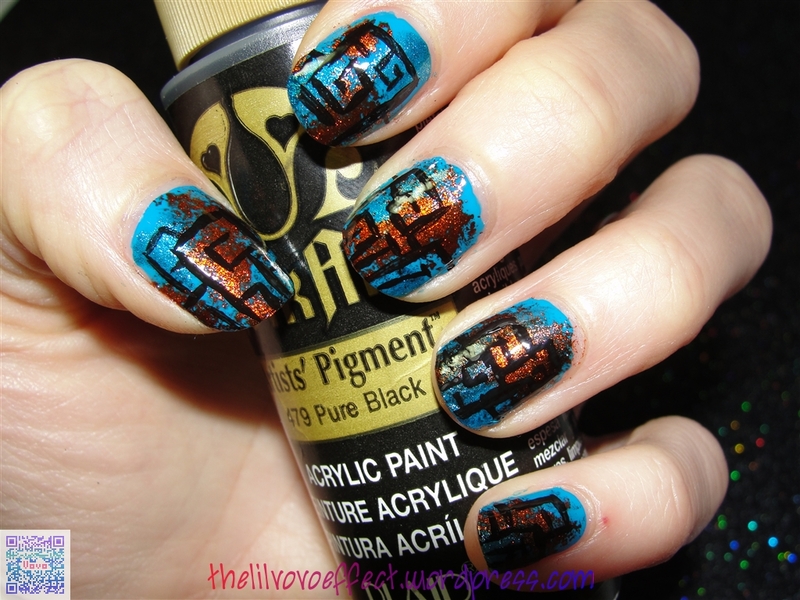 SO here are the nails that my 4yr say’s “looks like a game” and she means a maze! Haha. Anyways enjoy! Hello everyone out there!!! If you looked at the photo’s first you’re most likely not reading any of this! At all! You’re most likely sitting there slack-jawed, eye’s wide and drooling. XD Don’t worry…I’ll wait…….OKAY! 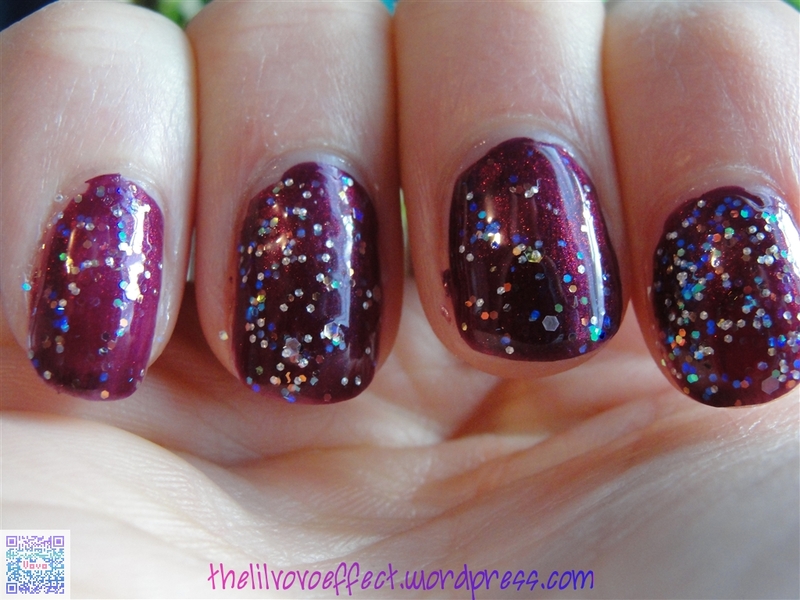 So now I want to tell you a bit about this wonderful drool-worthy polish. For those of you who don’t know about Glitter Gal, it’s an Australian brand and it’s operated by two CHICKS (Anna and Kerry)!!!! Right on! 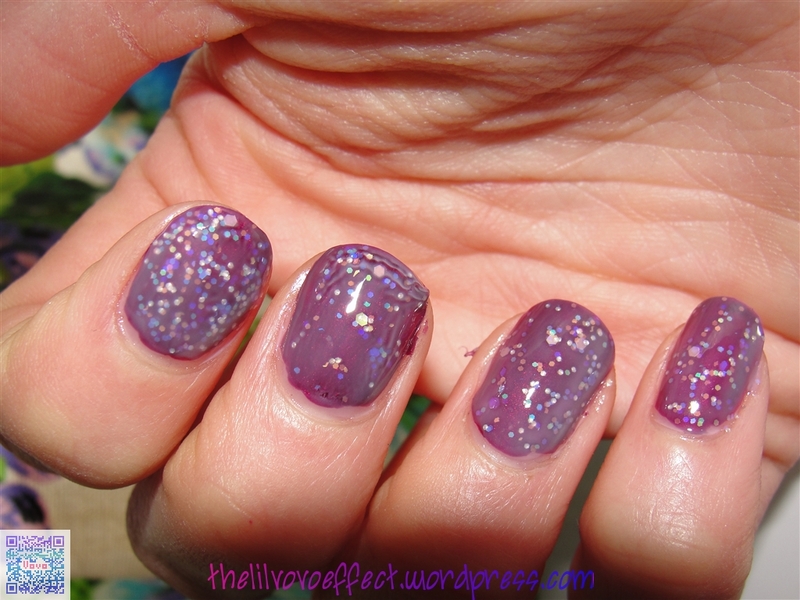 Both Anna and Kerry have been friends for many years and partnered together to create Glitter Gal Australia. 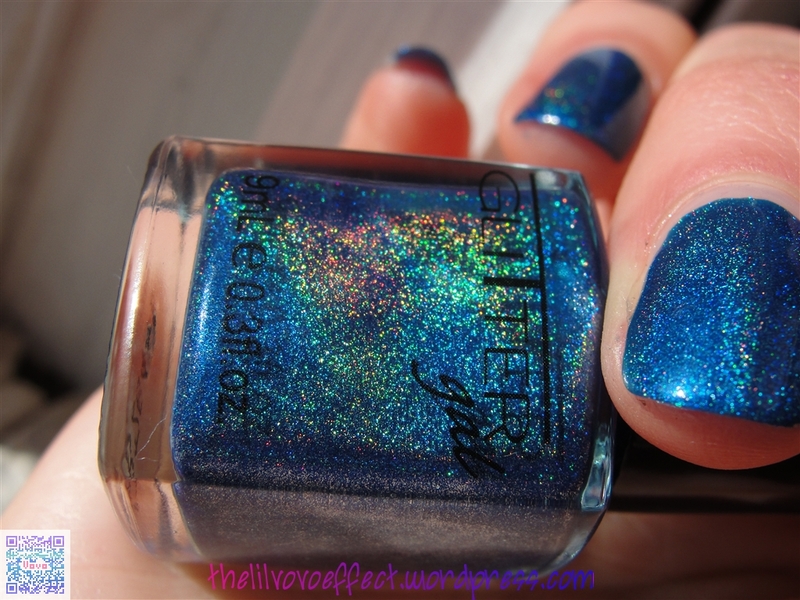 With Kerry’s experience as a makeup artist and Anna’s background in creating/supplying “private label” products to other Australian companies they have designed “Glitter Gal Australia” a great makeup and nail polish range. 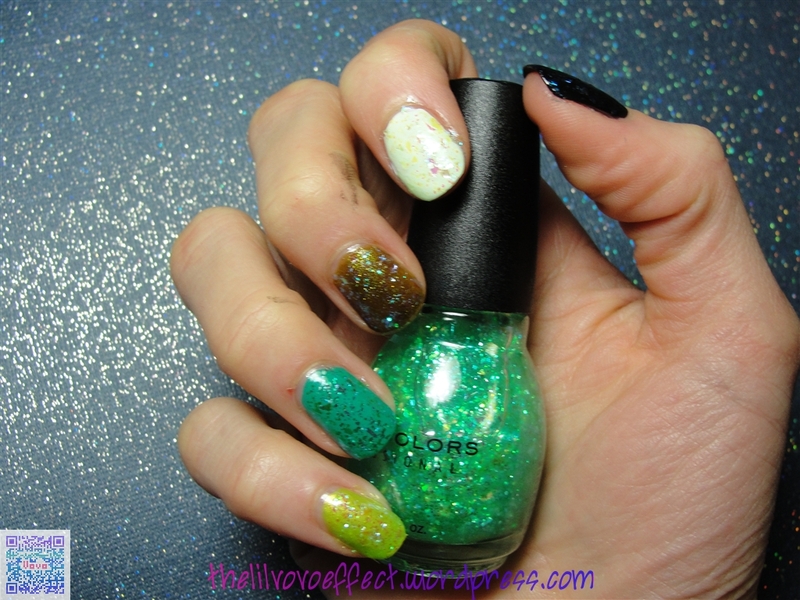 The thing I think is awesome about Glitter Gal is that they have very interesting and unique products- especially the nail polish. Their “sparkle” and “holographic” nail polish line’s are to die for and I’m practically on the edge of my seat waiting for their upcoming line’s “shade shifter”, “transitions” and “essentials”. First before anything else this IS a “Big 3 Free polish”! I only own one other holographic nail polish and I was a bit sickened when I found out that it was definitely not 3 Free. 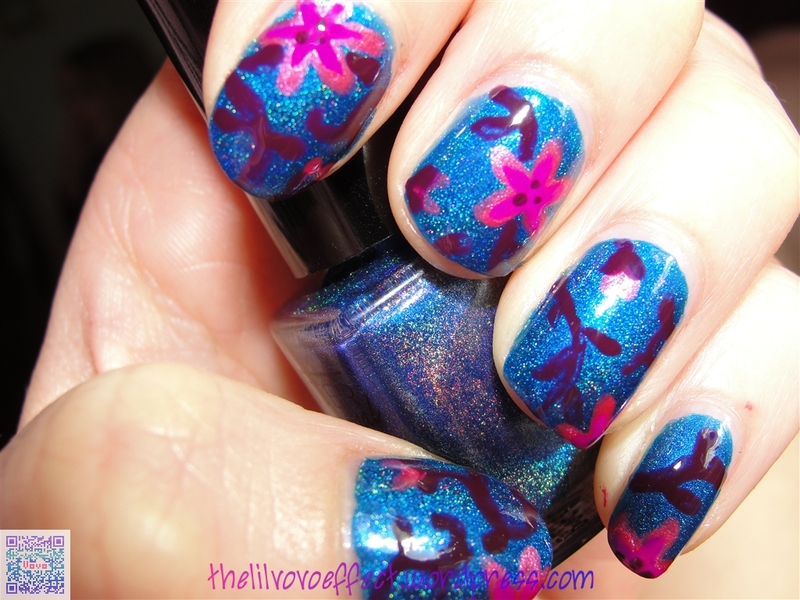 Blue Marine is an amazing deep blue polish. If I wasn’t taking pictures of it I honestly could have gotten away with doing only one coat for this bad boy. 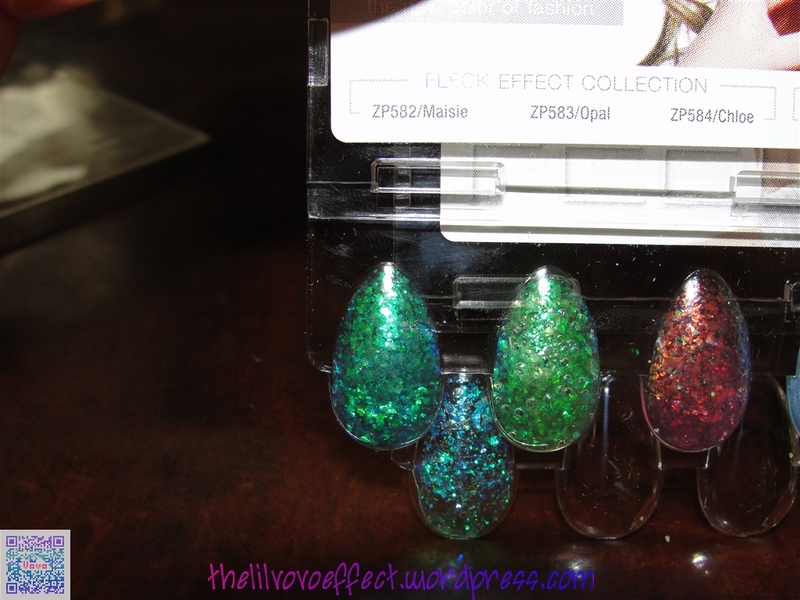 The quality is excellent, very pigmented.Very holographic sparkly. It dries very smooth too. I used one coat of Sally Hansen Insta Dri over top. And it’s blue!! ♥ it! 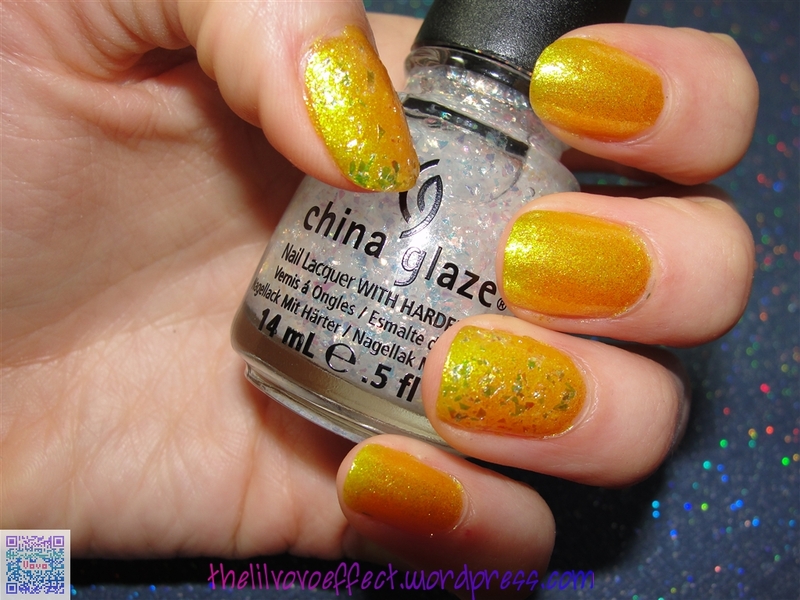 Glitter Gal sells their polishes on their website. They come in two sizes now the one in my picture’s is an 9ML- those go for 11.95 AUD (Australian dollar) and the bigger size is 15ML for 20.00AUD. 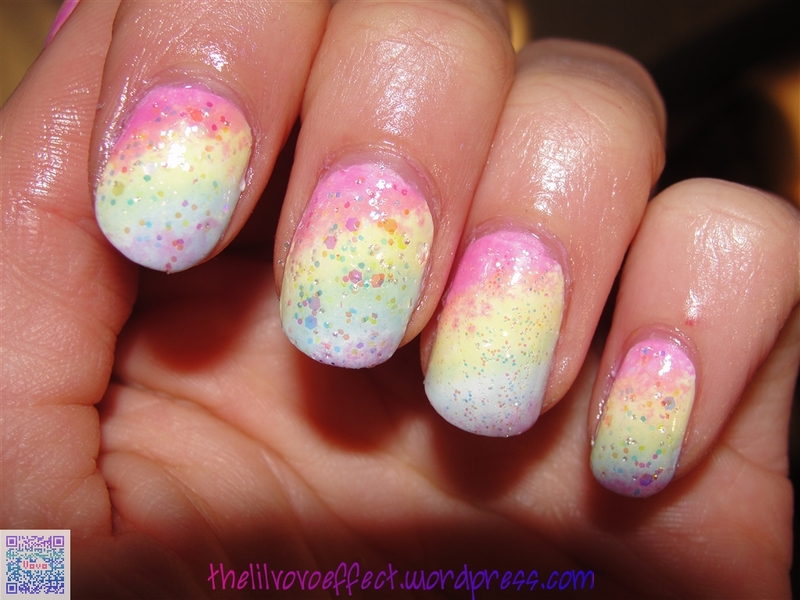 Their polishes can also be found at Llarowe $14 for 9ML and $20 for 15ML. This product was sent for review. All opinions stated are my own and not endorsed. See disclosure for full details. Are you going to wear green today? I don’t own anything green besides nail polish! Haha! Anyways here is my holiday inspired nail art! Sorry about my uneven nails….I’m very stubborn when it comes to giving up all my claws just because one or two had to go and ruin it for the rest of them. 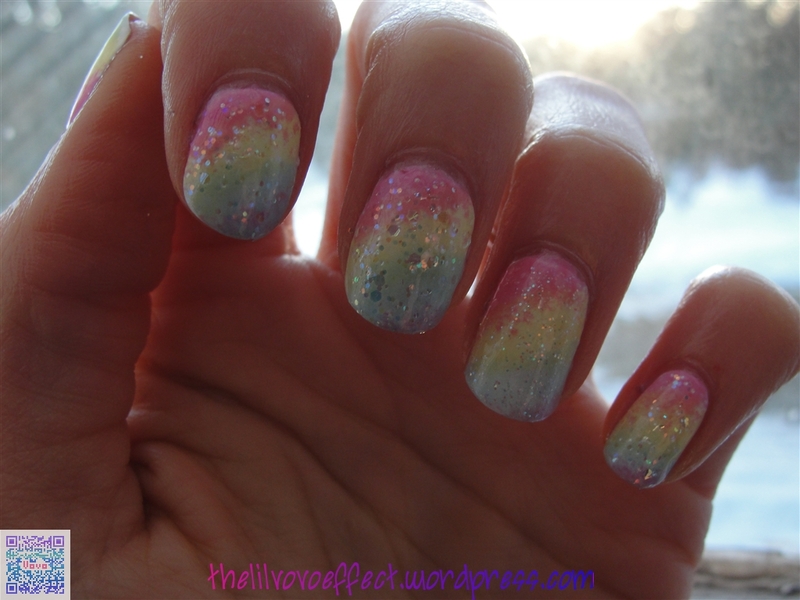 But eventually I will breakdown and desire orderly-ness on my nails. I honestly can’t tell you what color’s where used for the rainbow without diggin’ through my stash. 😛 Majority of them were Sinful Colors. 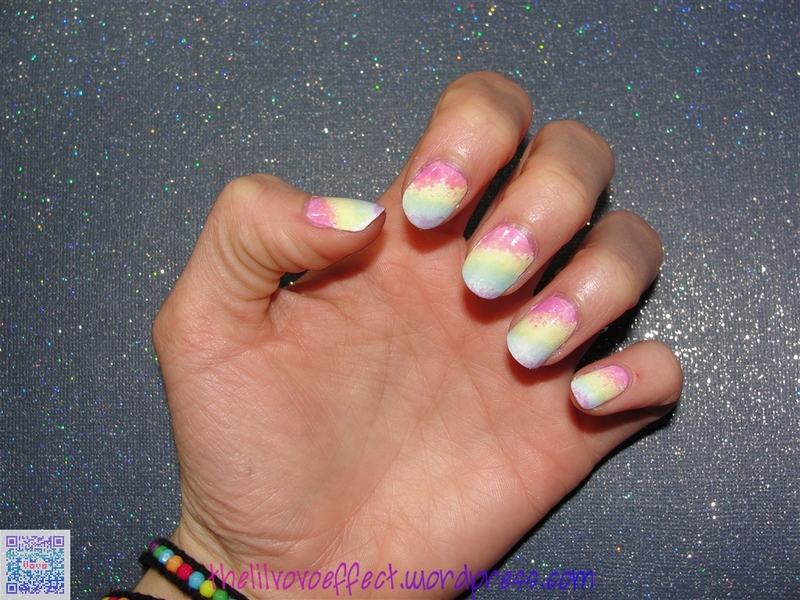 I did the rainbow using the “plastic bag method”, which if you Google that on YouTube you can find a bunch of tutorials and they’re all basically the same. Even though I could have done this free hand with a toothpick (or an orange wood stick) I didn’t feel like wait FOREVER for it to dry on my own hand and risk screwing it up. But yea- just use a white base so all your colors stay vibrant. 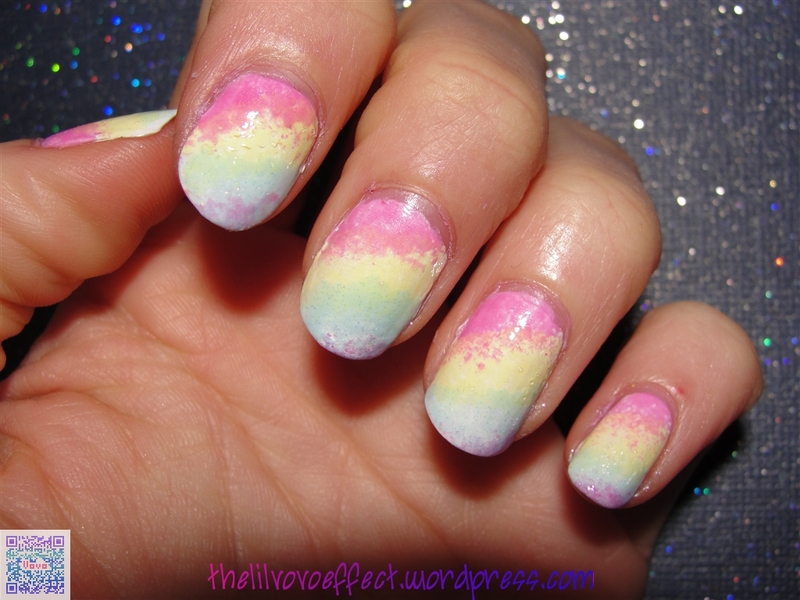 Oh and FYI I only did the rainbow itself and free handed the clouds on with the polish brush. ALSO, I had to use some tiny scissors to cute one end because it was too long and it stretched a little bit since it wasn’t completely dry. I’m so impatient. 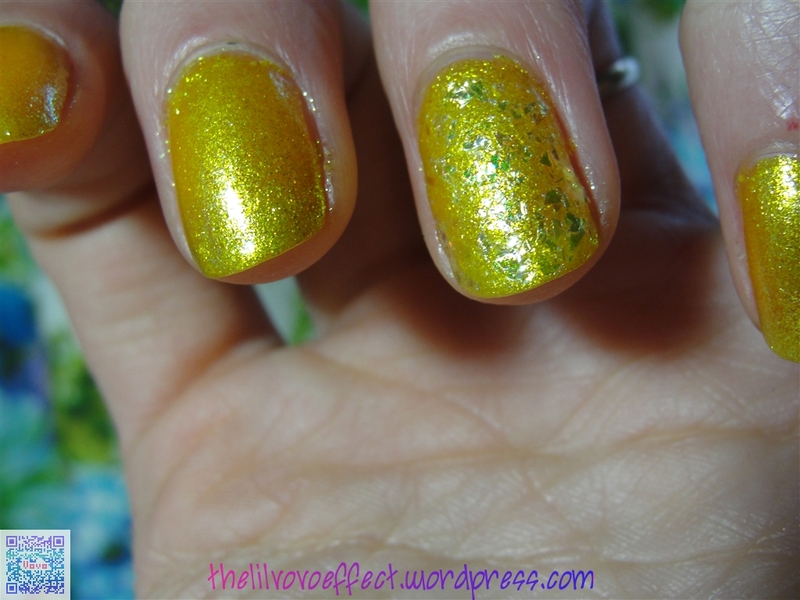 Also a side note on the glitter over the green- in Kleancolors Gold Caviar they base is a jelly yellow and rather thick IMO so I put a blob of polish on a folded up paper towel and fished out the gold glitters with a orange wood stick and the back of a straight pin for the ones near the top. I still did a swipe on the tips but didn’t want to carry the yellow all the way up and completely changing the vision of green and gold I had! Hope you have an excellent day and don’t get pinched! Hello readers. This next swatch was one that I really wanted to wear longer then the 5 minutes that I did wear it for. My hubby needed help and it was just already too late to wait for it to dry-BUT luckily I got a few pics before destroying it and having to just remove the whole thing. 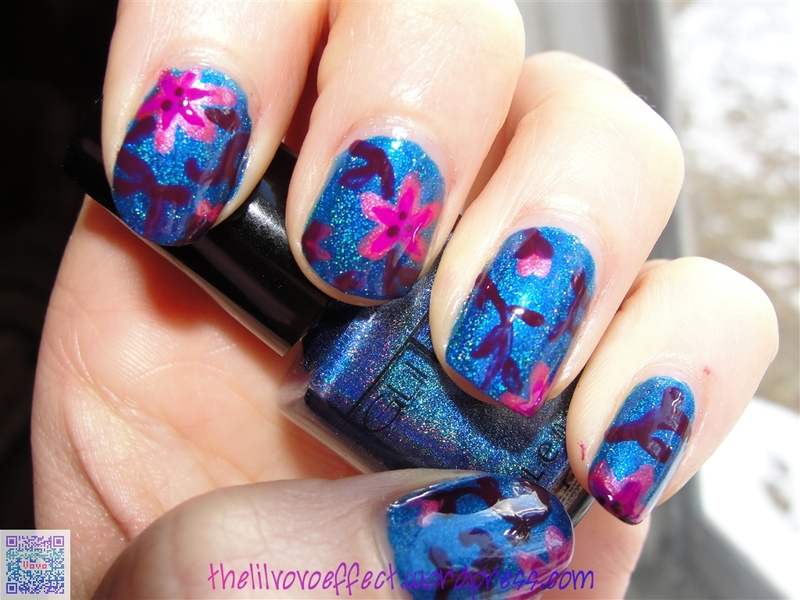 So here it is Kleancolor Holo Chome #94. These pictures really do it no justice. I couldn’t get a better one in that lighting, but I picked the one I felt showed its sparklies! It’s rather pretty and jelly looking. I did about 3 coats since it’s rather sheer. This is one from Kleancolor that I highly recommend. Just beautiful. So please click to get the full effect- the best to my picture taking abilities or lack of. Also Let me know what you think of the “gallery” viewing. Should I keep it that way or just go back to the way I posted before? For all you that thought this was about a real jelly sandwich- sorry I tricked you. 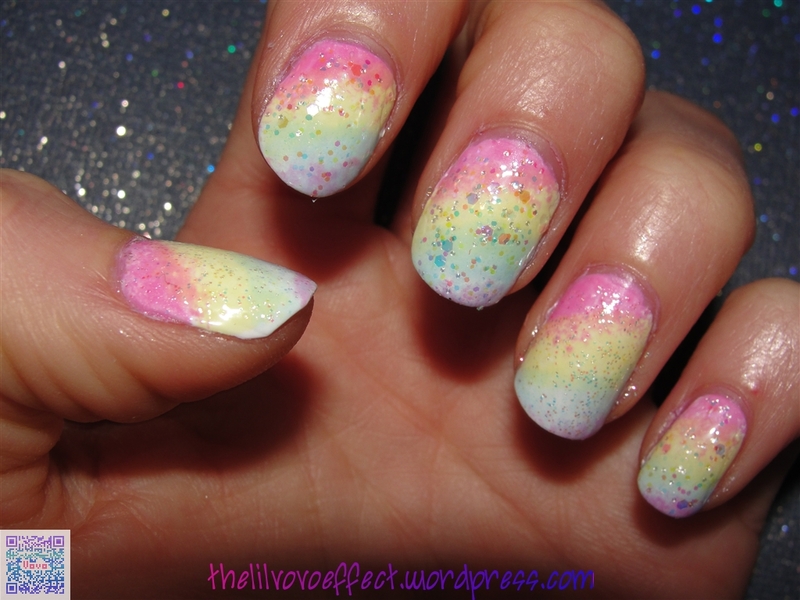 😀 This is about what is called a “candy manicure” aka jelly sandwich. 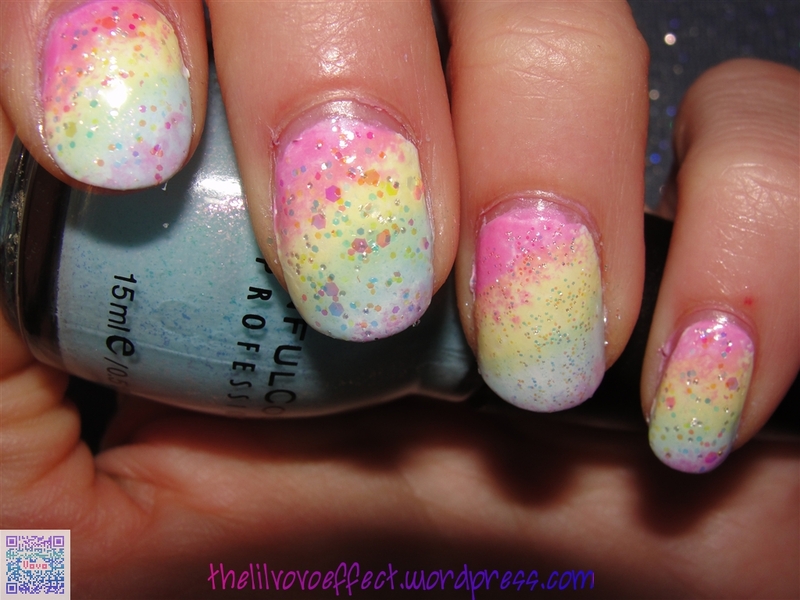 This consists of a base color, a glitter polish, followed by a “jelly” polish. 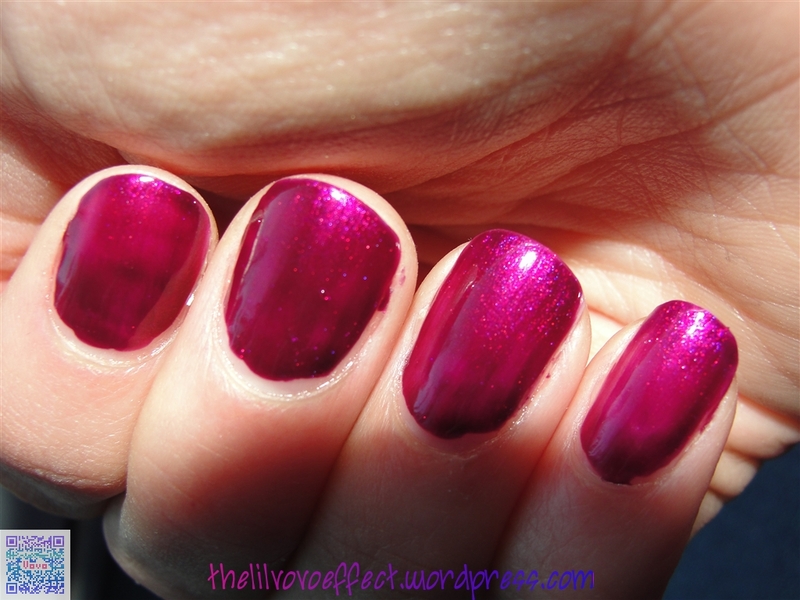 Jelly obviously meaning a clearish colored polish….like jelly. There is no right or wrong way to this. 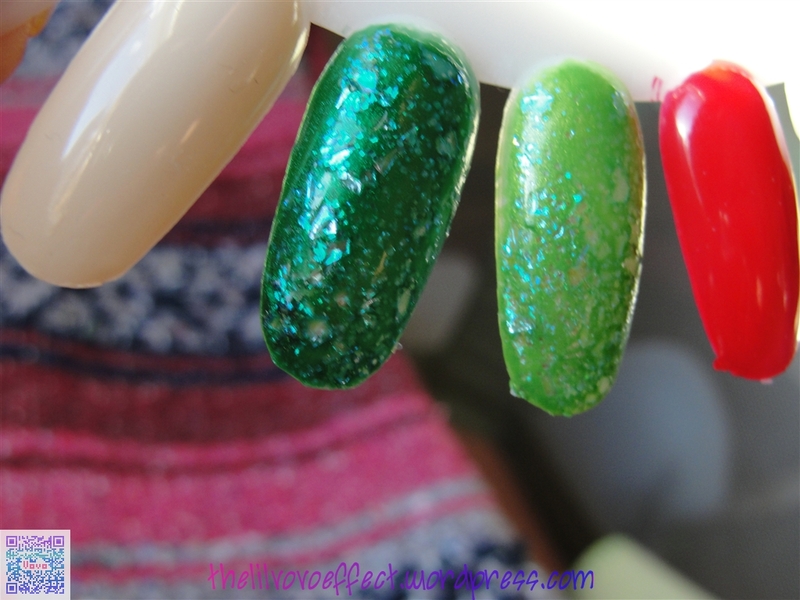 Some people do a creamy jelly finish(as I did) as their over glitter layer. Some people do another glitter layer! Sometimes people skip the base color. So to me it’s all about just having fun and experimenting. 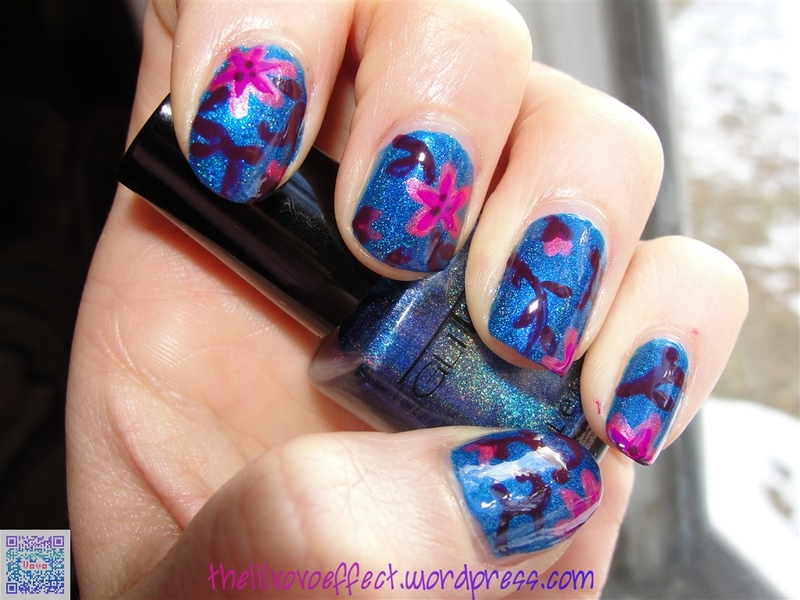 I think that’s sort of how some of these girls on etsy get their idea’s for their handmade/indie polishes that just look so freaking awesome and unique! This is were I should have stopped and gave up on the whole jelly sandwich idea. Also didn’t realize there was a HUGE drag on my middle finger. Uck…I hate this! In my head it seemed like a good idea. Next time I will look good and hard for a non creamy jelly finish. So hopefully there will not be a disappointing post on the next. I take back what I said in the beginning- apparently there IS a wrong way.